« Happy Birthday Golden Gate Bridge! 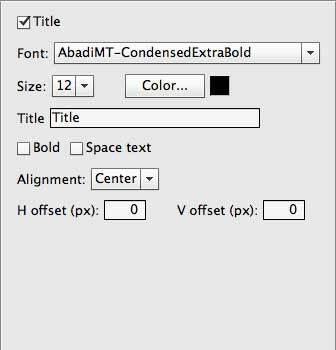 The script will size the final framed image to fit within the maximum width and height dimensions specified by the user, just as the Adobe Photoshop File>Automate>Fit Image… menu function does. 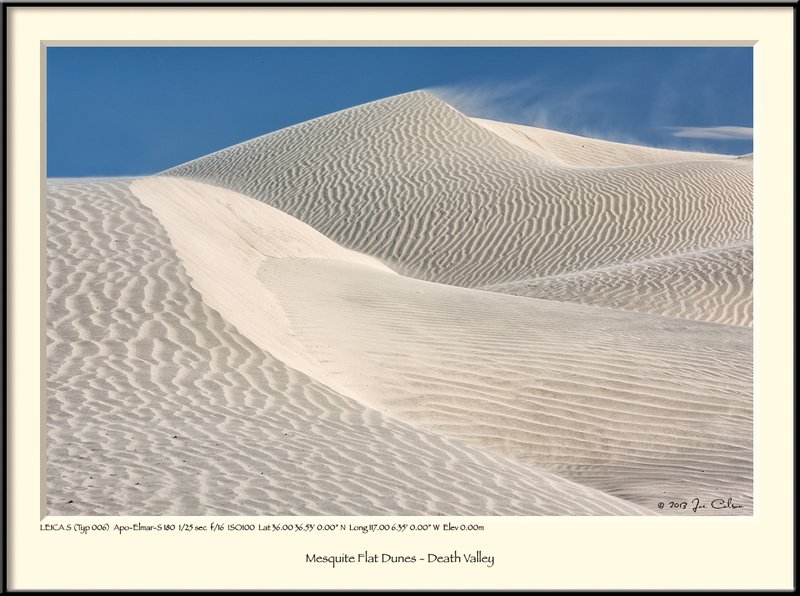 The image will not be distorted to fit the dimensions, but will be proportionally sized, then matted and framed to fit the maximum dimensions specified. Checking the Smart Sharpen checkbox will apply sharpening, similar to the Adobe Photoshop Filter>Sharpen>Smart Sharpen… menu selection, to the image (before the mat and frame are added). The Overlay style doesn’t add a mat. Instead, it converts the outer edge of the image (dimension set with the mat Size setting) to black and white. The opacity of the overlay is determined by the Opacity setting. A stroke can be added to the image for the Drop shadow and Plain mat selections. The mat can be set to have equal dimensions on all four sides (Equal mat), or set to have a bottom border that is twice the size of the other sides (Gallery mat). Here are two examples of what the script can do. Other examples of each mat style are in an earlier post. In addition to selecting the frame color using the Adobe Color Picker and setting the frame size (in pixels), you can add an inner shadow and set the size (Depth) of that shadow. 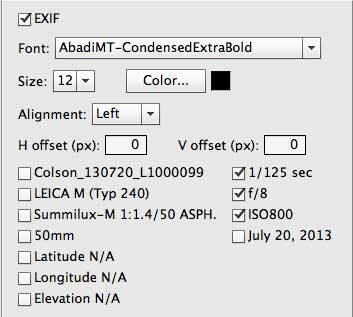 The (optional) EXIF text is by default positioned on the left in the bottom of the mat, but can be positioned either left, center or right. Its horizontal and vertical position can also be adjusted using the H offset and V offset boxes. If title information has been saved in the source image’s IPTC Title metadata field, the script will show that text in the Title text box. The (optional) Title text is by default positioned in the center in the bottom of the mat, but can be positioned either left, center or right. Its horizontal and vertical position can also be adjusted using the H offset and V offset boxes. If copyright information has been saved in the source image’s IPTC Copyright metadata field, the script will show that text in the Signature text box. 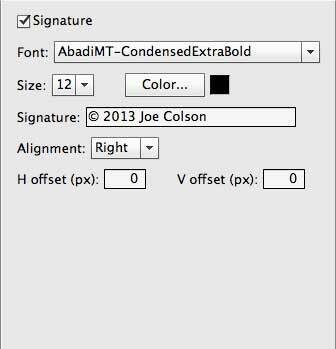 The (optional) signature text is by default positioned on the right in the bottom of the mat, but can be positioned either left, center or right. Its horizontal and vertical positions can also be adjusted using the H offset and V offset boxes. Once the other options are set, you can either run the script and save the result as a JPEG, TIFF, PSD, PNG or GIF, or run the script and have the framed image remain open in Adobe Photoshop. The latter choice is useful when determining how to set the options, particularly the text offsets, or when the user desires to manually adjust the layers in Photoshop. 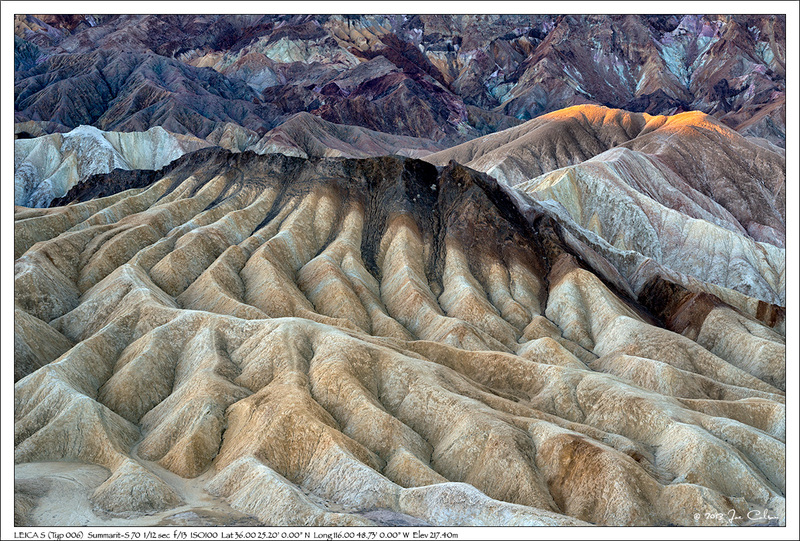 The image can be saved in the same location as the source file (Save in same location), or in a different folder, chosen by clicking the Select Folder… button. Clicking Cancel dismisses the dialog box and returns you to the open source file. Be sure to restart the Photoshop application after script installation. Or you can put the script anywhere (on your desktop for example) and browse to the script using the Photoshop File/Scripts/Browse… menu. Download the .zip file and, after unzipping, install as detailed above. 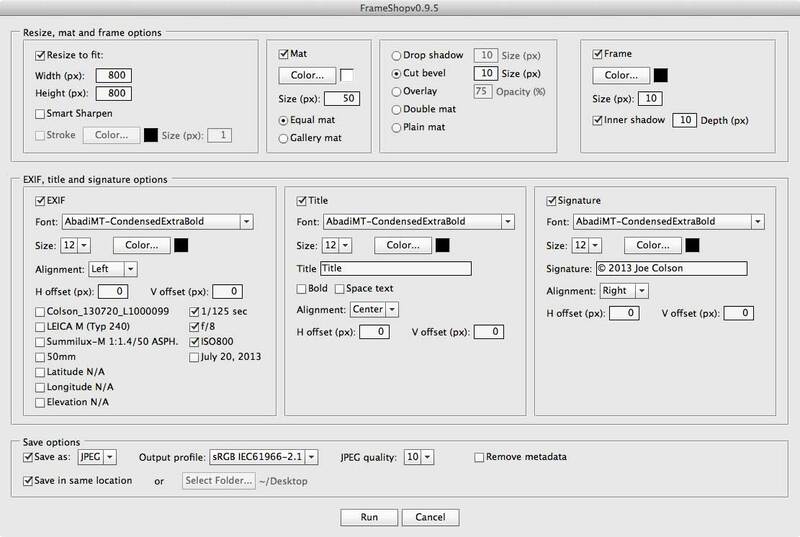 For those who became hooked on the color presets of the initial version of FrameShop, you can find popular hexadecimal Web-friendly colors on a number of websites. Just do a Google search for “hexadecimal color codes”. Here’s an example. Thanks to those who have allowed me to use their prior work in this script, and to those who have tested it and provided feedback. This entry was posted in Uncategorized and tagged Adobe, EXIF, Frames, FrameShop, Geocoding, GPS, Photoshop, Scripts.